← Have we given up on the genetics of febrile seizures? Selection. De novo mutations in neurodevelopmental disorders including autism, schizophrenia, and intellectual disability raise an important question: are the mutations identified in patients pathogenic or are they simply genomic noise? A recent study in Nature Genetics tries to answer this question by looking at expression of particular exons in the brain and the overall mutational burden in these exons. They come up with critical exons, which seem to be particularly vulnerable in Autism Spectrum Disorder. Defining critical exons through a combination of high expression in the brain and low mutational burden. Uddin and collaborators use this method to identify ~4000 exons in ~1800 genes. These genes appear to be preferentially affected by de novo mutations in patients with Autism Spectrum Disorder (ASD). Critical exons. The idea behind the study by Uddin and collaborators is actually quite simple: they break genes down into exons and examine the expression in the brain for each exon. Gene expression may vary exon by exon, as many neuronal genes have multiple splice variants. Secondly, the authors assess the frequency of rare missense mutations in controls. Finally, they define a subset of genes with high expression in brain and relatively few missense mutations in controls. These exons are considered “critical” as they are highly expressed in brain and tolerate little genetic variation. They identify 3,955 exons in 1,744 genes, which satisfy these criteria. Expression and mutation. The rationale behind this approach is the observation that there seems to be some correlation between gene expression in the brain, particularly in the developing brain, and the frequency of missense mutations. For example, for the SCN2A gene, exons with high brain expression have relatively few mutations. This observation also held for SHANK1, SHANK2, FMR1, and AFF2. Making sense of de novo. After identifying ~4000 exons considered critical, the authors investigated whether there is an enrichment of de novo mutations in these exons in patients with Autism Spectrum Disorder (ASD). They examined the Simons Simplex Collection, which was also used for various other studies in the past. In this cohort, proband, parents and unaffected siblings have undergone exome sequencing, and the rate of de novo mutations in patients and siblings was roughly the same. In fact, this observation was one of the breakthrough findings that helped us understand that we have to approach de novo mutations very carefully. 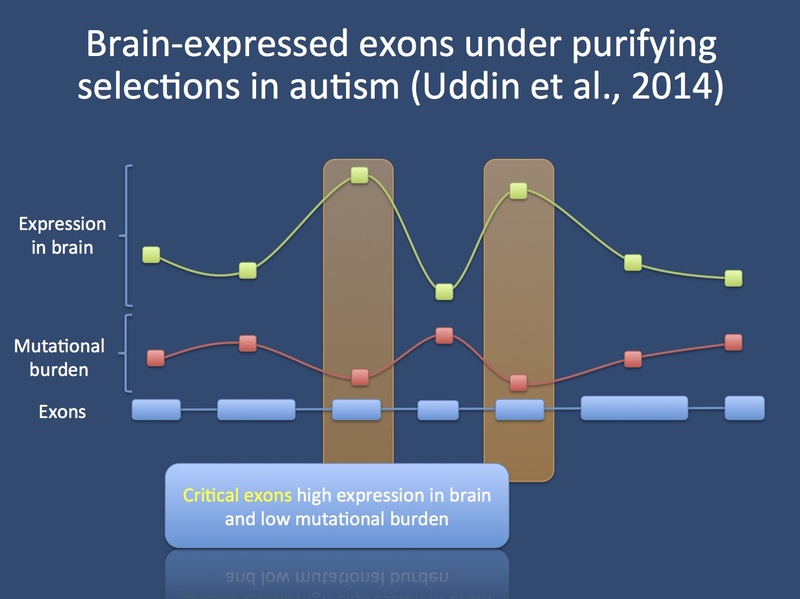 However, when the authors looked at mutations in critical exons, they found that probands with autism carry two times more mutations in critical exons (45%) than their unaffected siblings (28%). This suggests that the authors’ concept of defining relevant exons through expression and mutational burden might be meaningful. Critical genes. The authors identified roughly 1800 genes that they consider critical (link to Supplemental Tables). Many of these genes have a direct connection to epilepsy, suggesting that the concept of brain-expressed genes with low mutational burden might also be applicable to epilepsy. The genes include SCN1A, SCN2A, GABRA1, CASK, GABRG2, GRIN2A, and KCNQ3. Various genes have some connection to neuronal functioning, suggesting that the synaptic machinery might be particularly vulnerable to missense variation. However, I find it surprising that most genes that contain critical exons have not been found in epilepsy or neurodevelopmental disorders so far. In summary, the list of critical genes might add to our strategy to distinguish pathogenic mutations from genomic noise when assessing the role of de novo mutations. This entry was posted in 2014, Bioinformatics, Epileptic encephalopathy, Papers and tagged de novo mutation, Dravet Syndrome, epileptic encephalopathies, exome studies, functional variation, GABRA1, gene expression, intellectual disability, RVIS, SCN1A, SCN2A, STXBP1. Bookmark the permalink.